She ousted Republican Rich Vial in Tuesday's election, helping deliver a supermajority to House Democrats. Watching election results flood in on Nov. 7, Courtney Neron had to remind herself to breathe. "I was in disbelief for a while, and it hit in waves, because it was the disbelief and then the excitement and deep gratitude and thinking about 'what does this mean?'" 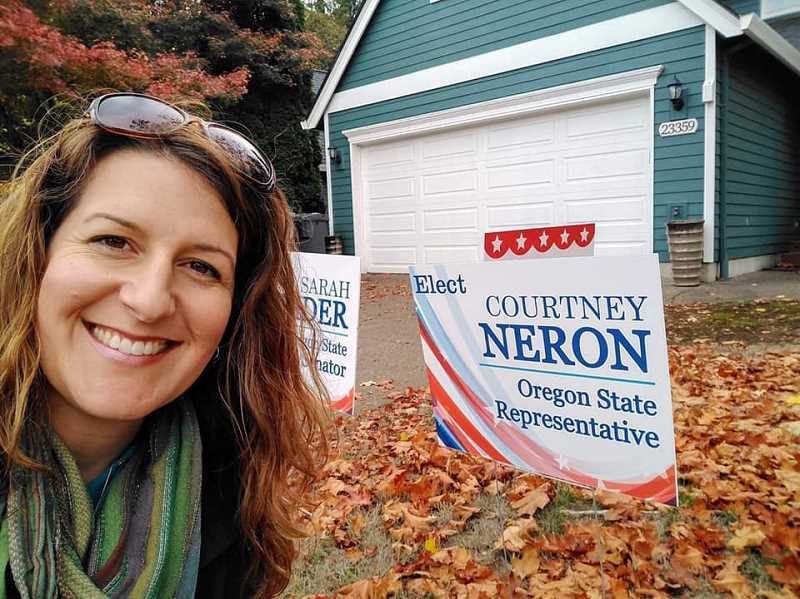 said Neron, who last week became one of Oregon's newest state lawmakers, representing a wide swath of Washington and Clackamas counties from Hillsboro's Century High School area south to Sherwood and east to Wilsonville. "It means that we might actually get to fund education (in Oregon)." Despite having no previous political experience and replacing nominee Ryan Spiker as the Democratic candidate only a few months before the election, Neron defeated incumbent Rich Vial by three percentage points to take Oregon's House of Representatives' 26th District. For Oregon Democrats, it was one of the most important wins in last week's election, flipping a Republican-held seat and leading Democrats to grab a supermajority in the Legislature. Now, Neron's focus is turning to Salem, where she will be sworn into office in January. A former teacher, Neron taught French and Spanish at Tigard and Tualatin high schools, as well as in the Yamhill-Carlton School District, for 15 years. Throughout her career, the Wilsonville resident dealt with large class sizes and budget cuts that forced teachers to do more with less, she said. "We still have our support staff, which are crucial, being cut right and left," Neron said. "We still have administration making very difficult decisions about who to keep and who to let go. What we need to do is set people up for success and not scrape by with the bare minimum." Last spring, Neron told Tigard High's principal she was resigning. As she put it, she wanted to take everything off the table so that she could put new aspirations onto it. As she contemplated switching from teaching Spanish to working with English-language learners, Neron focused more on advocacy and politics, becoming a committee member for the House District 26 Democratic Party precinct. It didn't take long for her life to change. At her first precinct meeting, the committee deliberated about who would replace Spiker, who withdrew from the race for health reasons after winning the May primary. Neron pitched herself as a compelling candidate, and was selected her as Spiker's replacement. Neron shelved her plans to teach ELL. "I spoke from the heart," Neron said. "I am passionate about setting up our education system for success." From there, Neron and her team hit the ground running. With weeks until election day, she spent her days canvassing, learning about local issues and talking with political leaders. "I started out most of my door interactions by saying, 'I'm a teacher that cares a lot about education funding and getting our resources into the classroom,'" Neron said. "'I'm a parent very concerned about environmental issues, wanting to leave a healthy climate for future generations. I'm also committed to finding affordable housing solutions as well as bringing affordable healthcare to all.'" She eventually garnered support from U.S. Sens. Ron Wyden and Jeff Merkley, as well from the Oregon Education Association and the Oregon League of Conservation Voters. House Speaker Tina Kotek was among those who joined Neron in canvassing in the campaign's home stretch. "My first campaign manager, she was talking about how a lot of campaigns take off like a jet," Neron remarked. "We took off like a rocket. We went straight up and straight out. We wasted no time." Though she lacked political experience, Neron and her allies felt that Vial's district could be flipped because registered Democrats have increasingly outgained registered Republicans. From September 2016 to September 2018, the number of Democrats in HD 26 rose 791, while the number of Republicans dropped by 228. Registered Democrats now outnumber Republicans in the district by more than 1,100. As Portland's Westside suburbs boom, HD 26 is at the epicenter of growth. Among other developments, the district contains a chain of large-scale subdivisions in various stages of construction from Hillsboro to Wilsonville, including South Hillsboro — the state's largest planned housing development — and River Terrace in Tigard, where homes have been marketed toward high-tech workers and their families, a demographic that tends to lean toward Democrats, politically. But Neron faced an uphill battle against Vial, who positioned himself as a centrist during his two years in the Legislature. He crossed party lines to support Gov. Kate Brown's bill to close the so-called "boyfriend loophole" which had allowed some domestic abusers to purchase firearms and co-sponsored a bipartisan push that raised Oregon's legal age to buy tobacco from 18 to 21. During his re-election campaign, Vial told the Pamplin Media Group that he found common cause with Democrats as often as Republicans, and planned to introduce a bill to refashion the Oregon Legislature in the mold of Nebraska's officially nonpartisan Legislature, doing away with party labels for state lawmakers. Vial also significantly out-fundraised Neron. While Neron collected $40,768, according to filings with the Oregon secretary of state's office. The Vial campaign raised and spent more than $200,000 in 2018 alone. Neron focused on progressive issues. Unlike Vial, Neron supported Metro's affordable housing bond measure. She was more wary of the push a runway expansion at the Aurora Airport, and favored the Extreme Risk Protection Order, which creates a process for taking guns away from individuals who are at risk of harming themselves. But despite their differences, Neron and Vial ran positive campaigns, something both expressed appreciation for. "She's conducted herself with honor and integrity in the campaign process, and I'm sure she'll carry those same qualities with her to the Legislature," Vial posted on Twitter Nov. 7. Neron's plan for funding education and decreasing class sizes is simple: She wants to raise Oregon's corporate tax rate, which is among the lowest in the country, and use that extra money to fund education. "It's a revenue problem," Neron said. "I do think there are solutions that we need to look at. I do think we need to look at the largest income earners to say: 'Hey, how can we ask you to be a fair player in our state's economy from the ground up?'" A member of Non Toxic Wilsonville, which has advocated for the city of Wilsonville and the West Linn-Wilsonville School District to stop using pesticides to kill weeds in parks, Neron hopes to change the state's list of acceptable pesticides and practices and to promote healthier alternatives. "That list has a number of toxins on it that I don't believe we should be spraying near children," Neron said. Neron hopes to join legislative committees related to education, the environment and as many other issues as she can, and to rely on the help of state employees to gain more familiarity on how the legislative process and bureaucracy works. "One of the legislators I talked to yesterday assured me that her law background is useless in Salem because legislators lead from their heart and their values and their principles," Neron said.